This post was originally published on April 10, 2017. I sound like a broken record when I say that I love breakfast. If I could I’d make most of my meals just some kind of variations of eggs, pancakes, waffles, french toast, and coffee. Lots of coffee! My husband and I love going out for breakfast. It’s quick, it’s fun, it’s delicious! And most importantly I get to have all the goodies of potatoes and breakfast meat and perfect toast and eggs. At home full breakfast is more difficult and rare. It requires a multitude of pans and time to manage them all. It needs stirring of potatoes, making sure that sausages are cooked but not burnt, remembering to pop in more toast, trying to time it in a way that everything is ready at the same time. Then all the cleaning of splattered grease and sink full of dishes. Last week I had an idea: what if I cook everything on one pan to avoid using three frying pans and stirring and watching them? It worked! It worked beautifully! Making this Full Breakfast requires very little effort and is actually easy. The result is so stunningly simple, beautiful, and delicious that I’m surprised why these kinds Sheet Pan Breakfasts aren’t more popular. 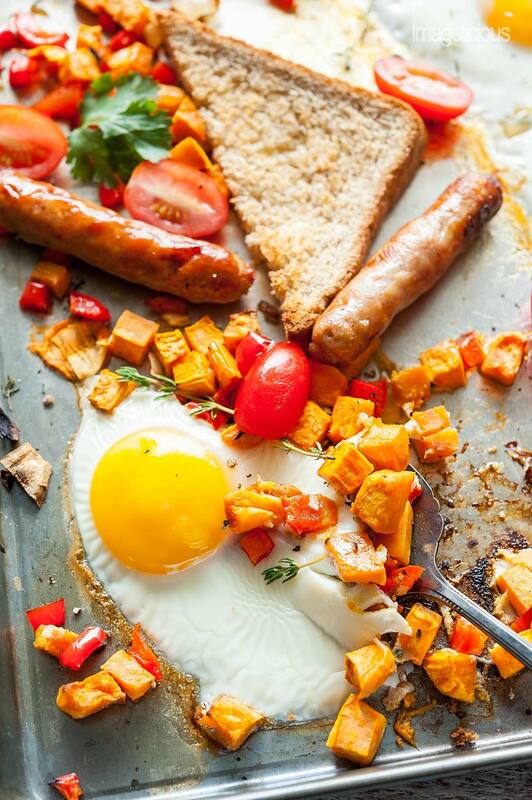 Perfectly charred sausages, sweet and slightly caramelized sweet potato hash, crunchy toast, oh, and the perfect oozing egg yolks! Add a few cherry tomatoes, a sprinkling of parsley or cilantro, a few shakes of black pepper and salt and dig in. No frying pans to wash, no stove to clean, no stirring, no watching. Just add, roast, and enjoy! 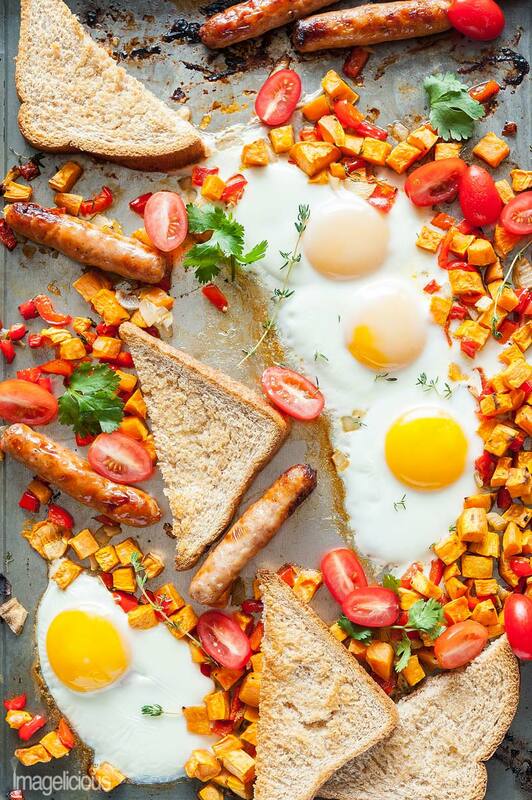 I made this Full Sheet Pan Breakfast many times. It makes enough for two people but if I make it on a weekday then I have half in the morning and half for lunch. I just scrape the leftovers onto a pan and warm them up gently on the stove (I told you I could have eggs any time of the day). What I love about this breakfast is that it could be made even faster if all the prep is done in advance. Then in the morning just mix everything on a pan and bake. It’s an epitome of a Mom-recipe: it requires almost no time to prep and no stirring and watching. 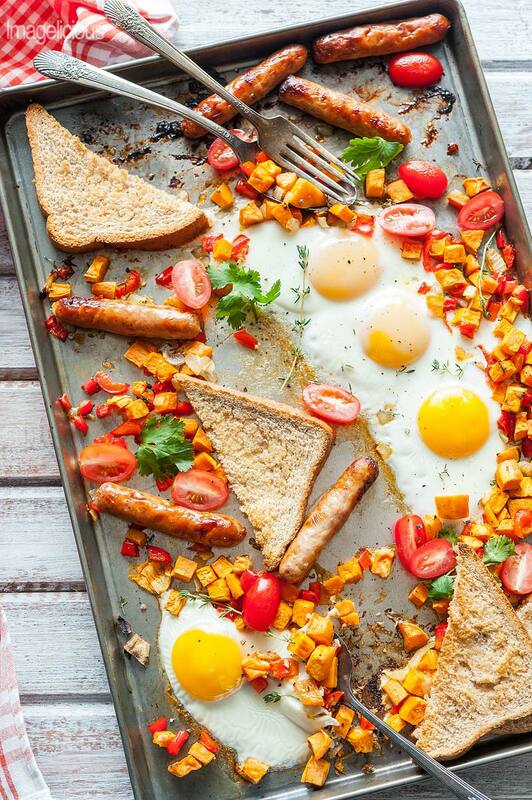 Just a perfect Sheet Pan Breakfast without (almost) any effort. 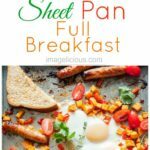 This Sheet Pan Breakfast recipe will be perfect for Easter Breakfast also! You can add more sausage or use less (or omit altogether for a vegetarian version). You could use buttered bread or plain (buttered is so much better). You could omit the bread altogether for a gluten-free breakfast. You could cook the eggs a bit longer for firmer yolks or break up the yolks a bit with a knife when you add them to the pan. Add different spices and seasonings that you like: rosemary, oregano, paprika, garlic powder, etc. Note: I wouldn’t recommend skimping on olive oil though. You need the sheet pan to be coated with it so that the eggs don’t stick. You can double the recipe if your pan is big enough, just make sure that the potatoes are chopped small enough and are in one layer so that they cook properly. You may need to increase the initial cooking time a bit for that. Once the sweet potato hash is cooked, just move the potatoes around and add eggs and sausages. You can place bread on top of the potatoes. All ovens are different and some cook food longer and some faster. The timing in this recipe is based on my oven but you could need a couple of minutes less, or a few minutes more, especially for eggs. I cook the potatoes and sausages initially for about 22-24 minutes and then once eggs are added to the sheet pan, I cook them for another 10-12 minutes and they result in soft yolk (not the fully runny one, but the soft and slightly oozing yolk that you can see in the video). if your oven cooks faster, then try only 7-9 minutes after the eggs are added. So make sure to know your oven and check up on the cooking progress when you are making this Easy Full Breakfast. 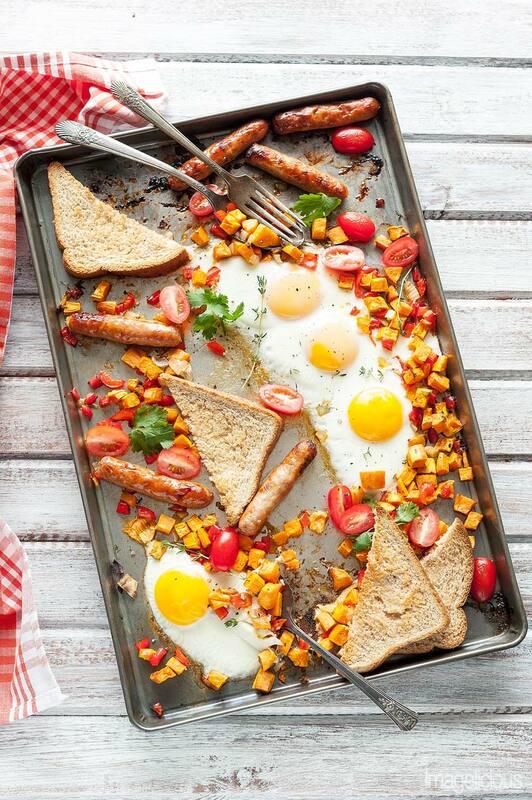 Don’t forget to watch the video to see how easy it is to make this Full Sheet Pan Breakfast. 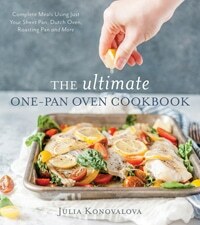 Well, first of all, if you love Sheet Pan (or one pan) recipes, then you need to buy my new cookbook, The Ultimate One-Pan Oven Cookbook, it has 75 original recipes that are all made in the oven on one pan, and there’s a Sheet Pan Mushrooms and Egg Recipe, it’s delicious! 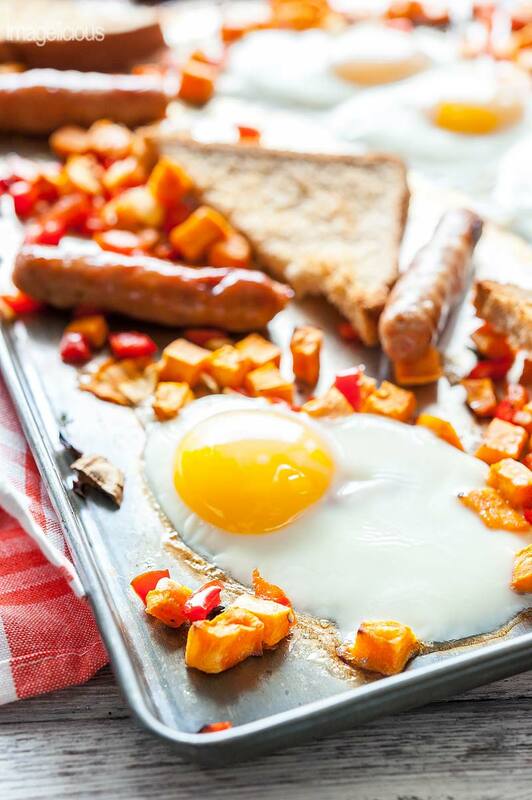 Don’t forget to watch the video to see how easy it is to make this Sheet Pan Breakfast. Chop the sweet potato into 1/4" pieces. Very finely dice the onion. Dice the sweet pepper into 1/4" pieces. Mix chopped sweet potato and diced onion and sweet pepper on a rimmed baking sheet. Add salt, black pepper, thyme, enough olive oil to fully cover the sweet potatoes and mix well. Spread the mixture in one layer on the baking sheet. Add sausages to the sheet pan in between sweet potatoes and bake for about 20 minutes or until sweet potatoes and sausages are almost done. Make little nests in the sweet potatoes and pour eggs there. Slice bread diagonally, butter (if using) it and add triangles to the pan. Return the sheet pan in the oven and cook for another 10 minutes or until egg yolks are cooked to your liking. See note. Serve with sliced cherry tomatoes, parsley and cilantro. As I mentioned earlier, some ovens take longer to cook and some cook faster. It took about 11-12 minutes to cook the eggs in my oven. It could be less for you. I'd start checking after about 7 minutes - make sure that egg whites are cooked and touch the egg yolk to see if it's cooked to your liking. 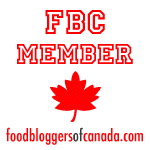 I love sheet pan meals for dinner – such a great idea to do for breakfast too! Can’t wait to give it a try!! This is such a cool idea! I’ve never thought of cooking breakfast this way before, I’ll have to try it and see how my family likes it. Do the eggs tend to stick to the pan? Can you use parchment paper under the eggs? Eggs really are good any time of day! 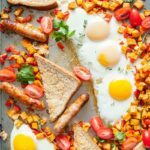 Love the idea of sheet pan breakfast! Oh I love the idea of sheet pan baking for dinner. I usually roast veggies for dinner but love that you added eggs and bread.. That looked so good. Gonna try soon. I am seriously drooling! And these photos are just stunning! What a great idea! Can’t wait to try this! !